With flexibility in communications standards, the USB to RS-232 Industrial Pro Line serial adapter USB-2COM-PRO supports RS232, RS422, RS485 with standard DIN-Rail mounting. Also see the 8-Port and 16-Port versions of this device for 19″ rack mounting. Includes standard DIN Rail Mounting brackets. Includes two Terminal wire blocks to connect to either side of the adapter. 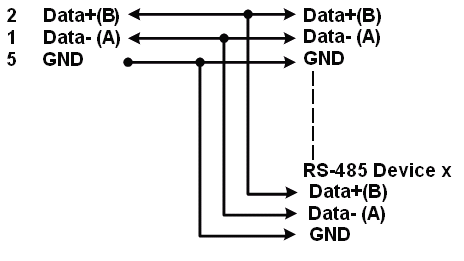 The 2 Port USB to RS-232 / RS-422 / RS-485 Serial Adapter supports Windows, Linux, and Mac systems that can support USB 2.0 port connections so existing serial devices can be used. The USBG-2COM-PRO is extremely flexible in offered communication standards. The Industrial PRO Line supports flexible RS232, RS422, and RS485 port communication. Each port can be individually configured by software (No Jumper). The ports have standard DB9 male connectors. The industrial-grade metal chassis can be easily used for DIN-Rail mounting, the 8-Port and 16-port versions also fit in a 19″ rack mount. The USBG-2COM-PRO 2-Port USB to RS-232 adapter with the 128 byte FIFO allows high-speed communication, even in heavy loaded systems. It’s unique features reduce the system load and also allows unusual speed settings like 500.000bps. A wired connection option via two(2) 5-pin Terminal Blocks is available on both sides of the serial adapter for use in easy wiring of devices.